Scientists are a step closer to solving the mystery of one of the great animal migrations. Each autumn, eels leave European rivers to travel across the Atlantic Ocean to breed for a single time, then die. Tagging studies show that the fish swim more than 3,000 miles (4,800 km) to the Sargasso Sea. But, rather than one mass spawning in the spring - an idea held for a century - their arrival is staggered, UK researchers say. "Eel migration is a rather romantic tale," said lead researcher David Righton, head of the Centre for Environment, Fisheries and Aquaculture Science (CEFAS) in Lowestoft. "Eels only spawn once in their lifetime and then they die, so they're making this final journey of their life, towards the Sargasso Sea, to meet their life's goals, if you like. "And so the fact that we've got a little bit of insight into that - but we've also got some new questions about how eels tackle that really fundamental problem of meeting that life goal - is really, really fascinating." The life cycle of the eel has long puzzled scientists. Even the Greek philosopher Aristotle pondered the question of where eels came from, deciding that they sprang up spontaneously from the mud. Almost 100 years ago, it was discovered that their destination was the Sargasso Sea, in the western Atlantic near the Bahamas. This led to the assumption that all eels took the shortest and quickest route across the ocean from freshwater rivers and streams. "What we've found is that [some] eels actually take a more convoluted route to the Sargasso Sea," said Dr Righton. "We propose that eels probably have a strategy that enables some eels to arrive in a very short period of time but others to take a longer, more meandering journey and perhaps arrive up to a year later and spawn in the subsequent seasons." Eels arrive around the European coast as tiny glass eels, having drifted across the Atlantic for two or three years from the Sargasso Sea. In the autumn, the mature eels - growing up to one metre long - leave European rivers and fresh water and disappear into the ocean, never to be seen again. Until now, it has been very difficult to study their migration across the ocean. Now scientists have a "roadmap" of the migration of eels towards the Sargasso Sea, based on tracking hundreds of eels from five locations in Europe. Data from the five-year study shows that most eels begin their migration between August and December. Yet, the migratory timing and speeds of eels vary so that only the fastest arrive in time for peak spawning in the Sargasso Sea in the spring while others arrive much later, only to breed the following season. The European eel is classed as critically endangered. The fish face many threats on their migration, including damage from hydropower turbines, disease and parasites, exploitation and trade, habitat loss, pollutants, and predation. 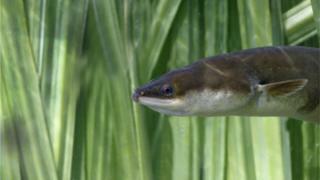 A management plan is in place within Europe to try to boost eel numbers. The new information about the rate of migration and their migratory strategy will help to improve that knowledge base, say the researchers.